Hybrid Camera Revolution: Adorama has their Hands on the Pocket Cinema Camera! 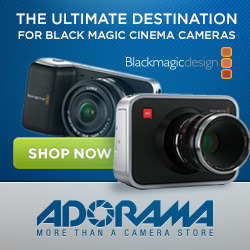 Adorama has their Hands on the Pocket Cinema Camera! According to this August 15th blog post from Adorama, they have their first camera in - which gives hope to all of us who pre-ordered our Pocket Cinema Cameras there. In the meantime, the box cutter and my Olympus 11-22mm lens, Panasonic MA1 adapter, Wooden Camera hot shoe, Rainbowimaging pistol grip with trigger, and 64GB ADATA SDXC card all wait patiently by the door, ready to get the box open and shoot some ProRes as soon as the camera arrives! NEW Sony A3000 - Entry-level DSLR killer? Wedding Shooters - Don't Let This Happen To You! Video from Blackmagic's August 8th NYC Event!